Nathan Bell doesn’t follow convention. Let’s start with the title of this studio album, ‘Loves Bones and Stars, Love’s Bones and Stars’ – the marketing department would have a fit. He’s also released a new live album at exactly the same time – the management would claim that this is crazy. That live album was recorded in Wales by a man who hails from the US and called ‘Er Gwaetha Pawb A Phopeth’ – are you kidding? At his live shows, he’s stated that he’s had problems with authority that has affected previous jobs. 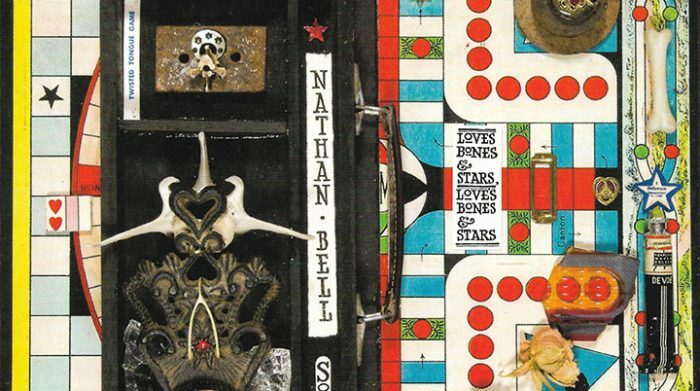 These are all good reasons to pay attention to Nathan Bell and his music. So, what of this new studio release? The self-declared ‘Family Man’ (as it says on his guitar strap) has a trilogy of other records that are grouped under this title. However, in true idiosyncratic style, there’s no escaping family on ‘Loves Bones and Stars, Love’s Bones and Stars’. The title track spells that out clearly in a reflective song on family from a man’s perspective. The album opens with ‘I Would Be A Blackbird’, a song written about his wife Leslie some years ago that he’s just got around to recording. Its tenderness is typical of the feel that pervades several of the songs on here. For example, ‘A Day Like This’ offers up advice from an elder’s perspective like “stay young at heart, be an old soul”. Later, ‘My Kid’ is the mirror image in that the parent hears their son repeat their own similar experiences and views as well as asking some of those impossible questions like “why when it’s so easy to be kind and grateful, do people work so hard to be selfish and hateful”. As Nathan Bell says, “good question”. You’ll recognise that lyrically much of the music comes from the heart and appears to draw on personal experience – many of the songs have dedications to family and friends. Whether ‘Whiskey, You Win’ comes about from his past life or not, it perfectly illustrates that life is not always roses around the door. In offering this balanced view, there’s similar hardship on ‘Gold Wedding Ring (Please, Mister, Please)’ as a couple seek to earn enough to settle down together. Music hasn’t been mentioned much in this review as it’s the lyrics that sit to the fore on these recordings. Musically, Nathan Bell contributes vocals and various string accompaniment, mainly guitar, with a tight circle of friends adding harmony vocal, cello and occasional drums and bass for a quite understated but melodic approach. Oh yeah, for non-Welsh readers, that album title translates as ‘In Spite of Everyone and Everything’ – well, of course. Justified optimism in the face of life’s trials and tribulations. Let’s hope that this optimism pays off to bring blessings on Nathan Bell and his family – to paraphrase him, open up your ears, it’s all brand new and perfectly good for you.